We can't see magnetism, but it's everywhere around us--even the Earth is a giant magnet! 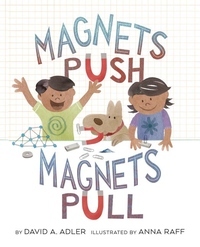 In this fun and accessible book, DAVID A. ADLER covers the basics of magnetism. Terms such as attraction, pole, electromagnetism, force and more are plainly explained, while ANNA RAFF'S lively art illustrates these concepts clearly. Suggested activities include instructions to make your own magnet! Kids who read this direct and uncomplicated introduction will learn to appreciate how magnetism powers our world. Includes glossary.